Is there any nuclear site in the United States that is not currently collapsing, leaking or otherwise posing a major health or environmental risk? Certainly there are, but that number is becoming smaller and smaller. In addition to three other nuclear disasters unfolding across the country, a fourth has now arisen. This new disaster is located in Washington state in a facility known as the Hanford site. According Gerry Pollet, a Washington State Representative, those tanks were never expected to last longer than 20 years. Twenty years was a dream in the first place. And, as you know, some of them didn’t last 20 years – and we had a small explosion on the 1950s. That hot waste boiled; created a steam explosion under the tank, and we were lucky that we didn’t have half of eastern Washington having to be permanently evacuated. 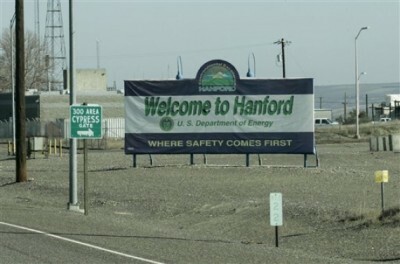 The company operating the facility acknowledged “higher-than-normal readings for contamination” for a certain tank, but claimed that the readings “well below the alarm level.” RT correspondent Alexey Yaroshevsky traveled to the Hanford site with a Geiger counter. Yaroshevsky measured the radiation levels of a rock laying well outside of the containment facility and, while the readings were not considered an emergency even the reporter’s handheld device registered a higher-than-normal level of radiation. Yaroshevsky wondered aloud whether or not the radiation levels closer to the center to the containment facility would be much higher. The reports of the Hanford site leakage now add a West Coast dimension to the nuclear crisis that has escalated in the last few weeks. In addition to Hanford, reports West Lake Landfill in St. Louis, Missouri which houses sizable amounts of nuclear waste is facing an approaching fire from an adjacent landfill that threatens to turn West Lake into a cauldron of radioactive air pollution. In addition, a nuclear power plant in Turkey Point, Florida is reportedlyleaking polluted water into Biscayne Bay. New York’s Indian Point power plant is also threatening to become a major radioactive incident. Constant leaks, mishaps and other signs of an outright collapse have existed at Indian Point for quite some time but have increased in frequency over the last year. Brandon Turbeville – article archive here – is an author out of Florence, South Carolina. He is the author of six books, Codex Alimentarius — The End of Health Freedom, 7 Real Conspiracies,Five Sense SolutionsandDispatches From a Dissident, volume 1 and volume 2, The Road to Damascus: The Anglo-American Assault on Syria, andThe Difference it Makes: 36 Reasons Why Hillary Clinton Should Never Be President. Turbeville has published over 600 articles dealing on a wide variety of subjects including health, economics, government corruption, and civil liberties. Brandon Turbeville’s podcast Truth on The Tracks can be found every Monday night 9 pm EST at UCYTV. He is available for radio and TV interviews. Please contact activistpost (at) gmail.com.